I grew up on a farm in Saanich (area outside of Victoria on Vancouver Island). We hardly ever bought fruit or vegetables from a store, because most of it grew in our own backyard. If Mom wanted to cook carrots for lunch, we went outside and pulled a bunch of carrots from the ground. Dad used to say, "These are the best carrots I've ever tasted." We'd all nod our heads in approval. At that time I could care less, but the truth of the matter was, just-pulled-out-of-the-ground carrots are incredibly sweet. In comparison to carrots I've bought at a grocery store where, if I had a blind fold on, I wouldn't be able to tell what I was eating. This is why I like to take our gang to Farmers' Markets -- to show them what produce looks like before it goes to the grocery store. I remember how surprised Jen was to see how long carrot tops grew and the variety of peppers you could buy (not just red and green). In the summer there are hundreds of roadside stands in the lower Fraser Valley and Richmond where you can buy farm fresh produce. As well, here is a listing of several organized markets where you can find a bigger selection of produce, plus some food and crafts. Most farmers' markets run from June to October. West End Farmer's Market: Fresh fruits and vegetables, hand made crafts every Saturday from 9:30 am - 2 pm. Nelson Park (Comox Street between Bute and Thurlow), Vancouver; 604-879-3276. East Vancouver Farmer's Market: Sale of produce from local farms, food, and crafts. Every Saturday from 9:00 am to 2:00 pm. Trout Lake Community Centre, 3350 Victoria Dr., Vancouver; 604-879-3276. Fresh Local produce at the Upper Town Centre at 152nd. (Johnston Rd.) and Russell Ave.
Langley City Market In The Park! 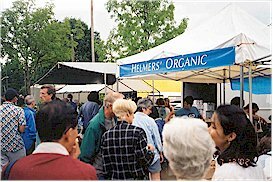 Vendor's wares vary from locally grown produce to homemade fudge, natural remedies, handmade artifacts and jewelry, art photography and garden accents and plants. The Market is located in beautiful Douglas Park, 20550 Douglas Crescent (corner of Douglas and Park Lane). 10275 - 135th St., Surrey, B.C. Second Ave. and James St.
Community Hall, 6418 Mt. Lehman Rd. Granville Island sells a mix of local and imported produce. During the late spring, summer, and fall several farmers have tables loaded with fresh produce. As well a small farmers' market operates in front of Carousel Theatre during the summer months (Every Thursday 9 am - 6 pm, May to October).